Vornamen + Angabe ob Erwachsen oder Kind (großer Stern/kleiner Stern)? Hand painted-No pressure or Plotterfoliengepappe! Noble door sign star in a noble anthracite and star pendants in grey with dots for the first names including desired text and free choice of font. 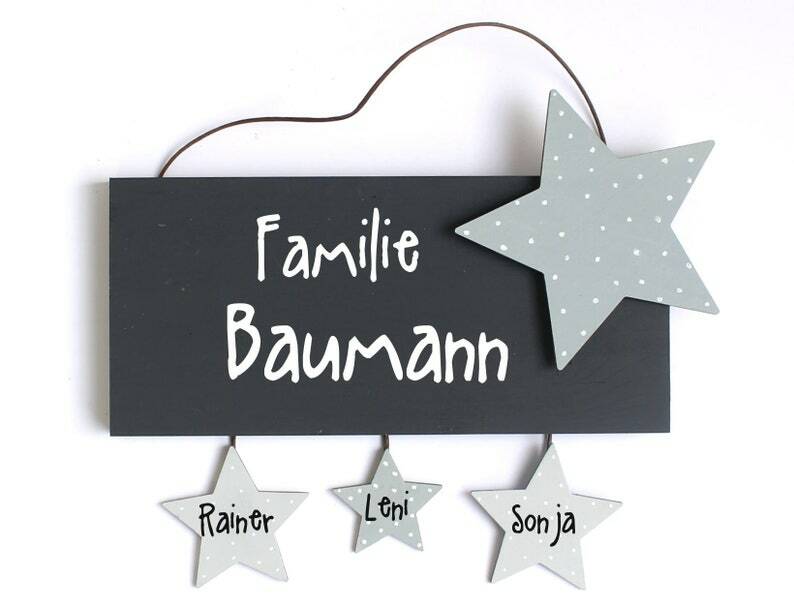 The main sign in anthracite with desired text and font, the star pendants for the members of the family to grow.. The two stars for the parents frame a little bigger the children-the Sternderl in the middle can easily be extended/extended for future generations. Size of the shield approx. h 14.0 x W 30 cm. Selection table for the possible fonts can be found in the product photos!